Protecting your oral health is vital to not only maintaining your oral health, but keeping your body healthy, as well. Some plaque buildup is normal, and while at-home oral hygiene can help keep it to a minimum, visiting the dentist for routine exams every six months will ensure its complete removal. If plaque remains on the tooth’s surface, it has a tendency to penetrate the gum line and can lead to a bacterial infection known as gum disease. This oral health condition can progress quickly and cause tooth loss, bone degeneration, and other serious medical conditions, such as heart disease and diabetes. Treating gum disease early can help reverse the side effects and prevent further damage. Our dentists at PQ Family Dental offer a variety of dental treatments, including scaling and root planing, at our Rancho Peñasquitos, CA , to help patients maintain healthy teeth and gums. 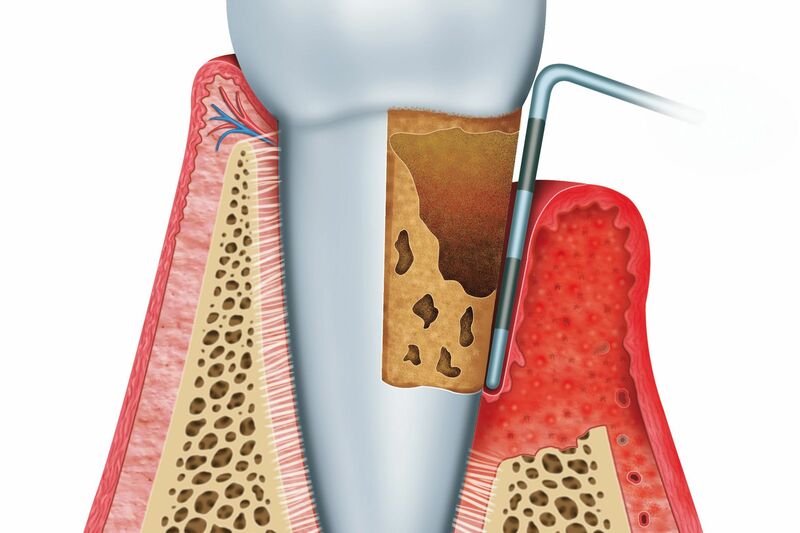 Scaling and root planing is typically recommended when the beginning stages of gum disease are diagnosed. During a traditional dental cleaning, the hygienist will focus on removing plaque from the tooth’s surface and along the gum line. Scaling and root planing is a deeper cleaning that removes plaque and unhealthy bacteria from below the gum line and root surface of the tooth. When gum disease is present, gums are usually red, inflamed, and may even bleed when brushing and flossing. As plaque and bacteria accumulate below the gum line, it causes the tissue around the tooth to separate from the enamel, causing pockets of infection. If the infection is left untreated, these pockets will continue to deepen and require more extensive treatment. At your appointment, gums are usually numbed with a topical or local anesthetic to prevent discomfort. The hygienist will then begin removing plaque from the base of the tooth and below the gum line with a handheld device known as a scaler. In some cases, an ultrasonic scaler may be used. Once the pockets have been irrigated and sterilized, a root planing device will be used to smooth the root surface of the tooth. This helps gums reattach to the base of the teeth so that food and other bacteria are less likely to get trapped below the gum line. To ensure the infection is completely treated, an antibiotic ointment may be applied over the gums. After scaling and root planing, you can return to normal activity immediately. You may experience some tooth sensitivity and gum tenderness for the first day or two, but nothing that an over-the-counter pain reliever can’t alleviate. If you were given medication to take, or a special mouthwash to use afterward, be sure and follow your instructions carefully. Patients with gum disease are usually encouraged to come in every three or four months for routine cleanings to help maintain optimal oral health. During these visits, the dentist will measure and monitor the pocket depths around your teeth to determine whether additional treatment is required. You will be encouraged to maintain healthy oral hygiene habits at home to help with your treatment. Be sure and brush your teeth twice a day using a soft-bristled or electric toothbrush, floss daily, and rinse with an antibacterial mouthwash. Eating a balanced diet and avoiding tobacco products will also help protect your smile. If it’s been awhile since you last visited the dentist, turn over a new leaf today. Contact our office today to schedule your consultation with one of our skilled dentists.